Legal marijuana growing in Colorado. 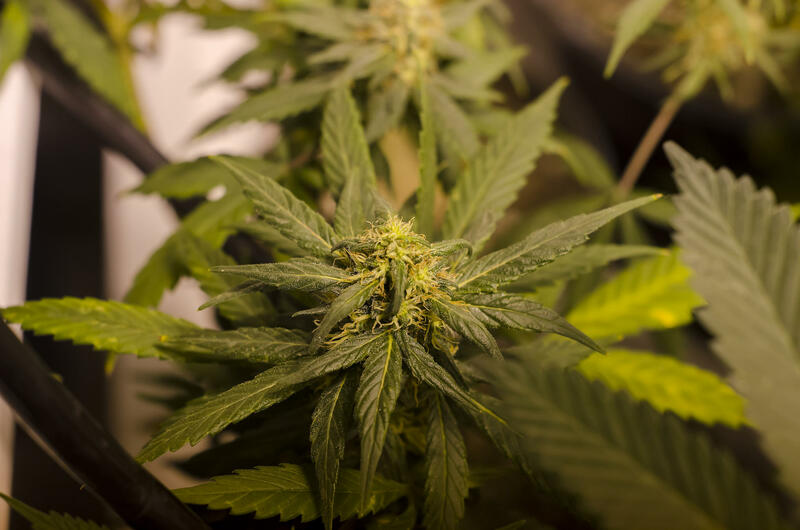 SOUTH PORTLAND, Maine - South Portland city councilors voted unanimously Monday night to put a measure on the ballot that would make recreational marijuana possession legal for adults in city limits. Similar questions are expected to appear on ballots in Lewiston and York this November. But the move is meeting resistance from medical marijuana caregivers in Maine, who are concerned that a broader plan to tax and regulate recreational pot statewide will affect their own livelihoods. Susan Sharon reports on medical marijuana proponents concerns about efforts to legalize pot for recreational purposes. It took years to develop a system to cultivate and distribute medical marijuana in Maine - years, even after voters here were among the first to authorize its use in 1999. Maine's law allows for eight tightly-regulated medical marijuana dispensaries around the state. It also permits people to grow small amounts of medical marijuana for themselves and a few patients. Paul McCarrier says the system works well, and he doesn't want to see it compromised. "Our biggest concern is that any sort of recreational marijuana program is going to have a negative effect on the current medical marijuana program," he says. McCarrier is the legislative liaison for the Medical Marijuana Caregivers of Maine. It's a trade association representing about 1,500 growers and patients who specialize in different strains of cannabis to treat nearly a dozen ailments included under Maine's Medical Marijuana law. McCarrier says many of these caregivers, who operate separately from the dispensaries, have at least one employee and were previously part of Maine's vast underground black market for the drug. "A lot of people who were in the illicit market have successfully transferred over to the medical marijuana market, and so people have good agricultural jobs that are paying them well," McCarrier says. "They're able to pay their mortgage. They're able to pay their taxes. They have a little bit of spending money at the end of the week. And so they're just generally happier." But recreational marijuana has already gained a legal foothold in the city of Portland, and McCarrier fears that if it is eventually taxed and regulated statewide, costs for medical marijuana patients, who number about 17,000, will rise. He says caregiver patients here currently pay about between $200 and $250 an ounce. In Colorado, where recreational pot sales went into effect earlier this year, it's a different story. Customers are paying about twice as much for recreational products. "Retailers can charge a premium for those products and the market will bear that right now," says Adam Orens. Orens is with Denver-based BBC Research, which recently did a market analysis of demand for marijuana in Colorado. Speaking on Colorado Public Radio, Orens said he hasn't seen as big a shift of medical marijuana patients over to recreational sales as he originally thought. One reason may be that medical marijuana is still taxed at a lower rate. And, in fact, the same study suggests that continued strong sales of medical marijuana may be why tax revenue from recreational pot is off state projections by about 60 percent. Orens thinks this will eventually change with market adjustments. "I think prices are going to come down once there is more supply, more suppliers and competition on the wholesale level, as well as the retail level," he says. There's no question that Colorado's medical marijuana program is now under more scrutiny, with some suggesting that it should be taxed at a higher rate. Paul McCarrier worries the same thing could happen in Maine. But David Boyer of the Marijuana Policy Project says there's another side to the story. Boyer's group is leading the effort to legalize recreational pot in Maine, and he doesn't think it will be a threat to the state's medical marijuana program. "Right now in Colorado, access to medical marijuana is better than it's ever been before and we could have that opportunity here in Maine," he says. "Ending marijuana prohibition makes sense for medical marijuana patients." Boyer says that's because so many adults in Maine are still using marijuana illegally, either because they can't afford the $300 cost to get a doctor's authorization for medicinal use, or because they have a condition that is not yet covered under the law. Whatever happens here, Boyers says marijuana will have to be taxed at a rate that's low enough so that the black market does not continue to flourish. He expects there will be an attempt to legalize and tax it in the Legislature next year or by statewide initiative in 2016. A South Portland citizen initiative aimed at making recreational marijuana possession legal for adults has qualified for the November ballot. That's according to the Marijuana Policy Project, a Washington, D.C.-based group which lobbies for reforming marijuana laws. "Voters were very receptive during the signature drive," says MPP Political Director David Boyer. "Most people agree law enforcement officials have more important things to do than punish adults for using a substance that is less harmful than alcohol." LEWISTON, Maine (AP) _ Marijuana advocates have submitted their petitions as part of a campaign to make it legal for people 21 and older to possess small amounts of marijuana in Lewiston. Citizens for a Safer Maine on Friday turned in more than 1,250 total signatures - exceeding the 859 necessary to qualify for the ballot in Maine's second-largest city. A group trying to convince Maine cities and towns to legalize marijuana possession for adults has submitted signatures in the town of York to get the measure considered for the ballot. Citizens for a Safer Maine handed in more than 200 signatures today to the York town clerk, twice the number needed. If the town's board of selectmen doesn't act on the petition, supporters can still get the measure on the ballot if they collect enough signatures to equal 10 percent of the local votes cast in the last gubernatorial election within 30 days.